WordPress site builders created a buzz in the WordPress industry following some years and to be honest, I had always remained against them. What I completely agree that it will help you build pages easily and quickly, but the cost is high. You will have to compromise on the code clutter that it puts inside your pages and bear slow loading times. Below are the reviews of updated Oxygen versions. This review is the about the initial Oxygen launch. For us, the main reason for not using the page builder plugins on WPArena is speed. Nowadays, new site builder plugins are coming rapidly, and the competition is getting tight and tough amongst page builder devs. Recently, I came across a WordPress Plugin called “Oxygen” from the developers of Soflyy (the same company that developed WP All Import), attracts my attention. After testing it for days and reviewing its features, I thought to write a detailed review of this great product. So, Oxygen Review will not be a typical review of the features explanation and what it does or what not. Instead, I took a little different approach this time and will review Oxygen app with my personal user experiences. Thanks to Louis for the OxygenApp license key. The WP community can categorize this Plugin in the page builders category, but this is little low to its original standards that I observe after using it. It’s actually a complete site builder. Oxygen is an all-in-one tool to design websites visually and in real-time with pixel-level perfection and control. Oxygen is equipped with a lot of features, and I am only giving a snapshot of these awesome features. To find the full list of its features, visit the Oxygen website. Visual Editor – Visually Edit any element, part or section of your website. This plugin also supports editing WordPress Menus, Headers and Footers. Live Editor – Now you can preview your edits live without refreshing your web page. Premade components – Premade components is one of my favorite feature of Oxygen plugin. It includes 160+ premade page blocks, 50+ pages of combine components and five prebuilt website demos. It will make super easy to design any website in instantly. Responsive Design – Don’t just take my word for responsive design, but design every page differently for each screen size. Yes, Now you can design your website different on both Desktops and Mobiles to fit your needs. Create Reusable Templates – Now you can design templates that can be targeted on multiple content templates like archives, pages, posts, etc. Edit Element States – Easily edit element states (e.g. hover, before, after, active) and custom pseudo-classes. Add Custom Code – Write custom code while designing your pages visually. Yes, it’s completely possible with Oxygen Plugin to add custom PHP, CSS, and HTML code. Prebuild Code Blocks – Use Prebuild code blocks to display contents directly from the WordPress Database. Custom Post Types and Custom Fields – Setup custom post types and custom fields easily with Oxygen Plugin. Apply oxygen templates to custom post types and add custom fields using code blocks or shortcodes. Reusable Parts – Reusable parts can be used in multiple places inside your website and is edited from a single place. Widgets Everywhere – Now you can use WordPress widgets just anywhere on your site even in pages and posts and not just in sidebars. Plugin Integrations – Add any plugin output into pages and posts using PHP, shortcodes, and widgets. Fonts – Oxygen includes 800+ Google Fonts. Oxygen also supports Typekit, letting you import fonts from a variety of type foundries. 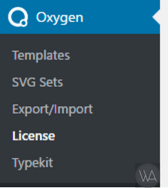 SVG Icons – Oxygen includes 500 SVG icons from font awesome and linear icons. You can also upload your own SVG icon sets from IcoMoon with a single click. SEO – Pages generated using Oxygen Plugin are Search engine friendly, and the code is neat. Child Theme – No need to use child themes as everything is saved in the database and you are free to upgrade the plugin without fear of losing customizations. Compatibility – Oxygen is compatible with all the WordPress plugins including SEO by Yoast and WooCommerce. Import/Export – Keep a backup of your designs and even export them to other WordPress sites powered by Oxygen. Let’s take a look on how to install the Oxygen plugin, and it’s usage. The first thing is to purchase your copy of “Oxygen” as it’s a premium plugin. Then, download the oxygen.zip file from your account. You will get a license key after completing the purchase on OxygenApp website. Copy it as you will need it later for activating the plugin. Go to your WordPress dashboard and click on Plugins > Add New. On the same screen, click on Upload Plugin button. Choose file and select the Oxygen.zip file from your computer. After the installation completed, click the Activate Plugin button. After activating the Oxygen plugin, go to the Oxygen menu in the left sidebar of your dashboard and select License. Now, paste the license key you copied during purchase or visit back to the OxygenApp.com to get your license key. After pasting the license key, click on the submit button. Now, you will get automatic plugin updates. After activating the main plugin, also activate the Components & Design sets using it’s own license key. Just repeat the above procedure to get your license key and submit it. Once activated, you will have access to many prebuilt components and pages that will help you tabs mentioned above your site quickly. That’s all. You are rocking with Oxygen Plugin and is ready to test it and build your next dream project. Let’s take a look at its usage below. I have installed, setup, and tested the Oxygen plugin on my test website from where I am going to teach you it’s usage. With oxygen, you can customize your website visually. Here is some important info that you must know before using it. Which Theme – Oxygen disables your theme. You don’t need any specific theme to use it. All portions of your website are controlled by Oxygen Like headers, footers, menus, sidebars, etc. Existing Theme – Oxygen disables your existing theme, so it can not be used to change your existing theme. Learn the art of using Oxygen Plugin and utilizing its features in detail. After completing the installation, click on Pages > Add New and create a new page. Give your page a Title and Publish it. You will get a new blue button “Edit in Visual Editor” after publishing your page right below your title. This will open a new interface of Oxygen visual editor. Fundamentals – The fundamentals tab is loaded with HTML elements such as Div blocks, code blocks, sections, headings, text, columns, images and more. WordPress – The WordPress tab provides widgets and shortcodes support. With Oxygen, using shortcodes and widgets anywhere on your page is a breeze, unlike traditional methods, this is not limited to sidebars. Reusable – The reusable tab is where your “reusable components” are saved. You can use the reusable components anywhere on your website. Components – The components tab consist of headers, footers, content sections, hero sections, pricing sections, call-to-action buttons and more. Design Sets – Design sets are prebuilt elements. To add any element from the above-mentioned tabs, just select it. After adding the element on your page, you will have tons of options on both right sidebar and top toolbar to customize them however you wish. Similarly, you can add more elements and after finishing up your design, just click the save button. Close the visual editor by clicking on “back to wp” button, and open the newly designed page to see how it looks in your browser. That’s all. It’s as simple as it seems. Here is a great overview video from Louis, the plugin’s lead developer. Support matters a lot while purchasing digital products. The support team at Oxygen is accommodating and provides round the clock support and replies back within hours. You can reach them using their support email or the support page of Oxygen Website. Oxygen devs provide extensive documentation alongside video tutorials. This will help a lot in setting up your first site using Oxygen and running it. 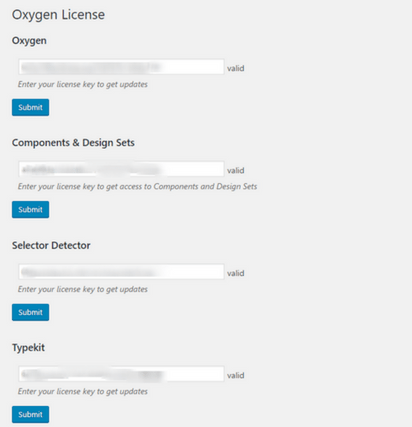 Further, for testing purposes, they setup a demo site for Oxygen plugin. You can try the plugin before purchasing it. Soflyy team started selling the plugin at an introductory price of $99 for a limited time. It’s a one-off payment and comes with a 30-day money back guarantee. Once purchased, you will get a license that will entitle you to the lifetime updates and support. You can use the Oxygen plugin on unlimited sites including client sites. 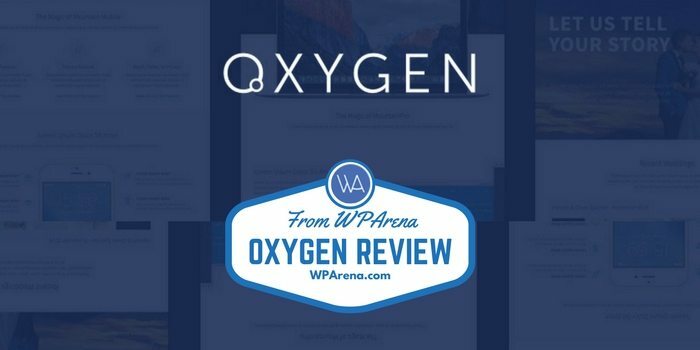 After testing all the WordPress page builders, I can easily conclude that Oxygen App is the best, I had seen ever. The compatibility of this plugin alongside features and code quality makes it unique. Unlike other page builders, it doesn’t add useless code on your site’s pages and slowing it. It also loads minimum CSS and JS files that make it unique as well. The most impressive feature of this plugin is that you can control and design just anything on your website from menus to sidebars and headers to footers. I’ve wanted to find a builder that can provide a more bespoke look and feel. This looks awesome. And at that price is looks a great deal. Thanks for the cool review.